Recently I created an illustration for the Kid Stuff fall catalog cover. 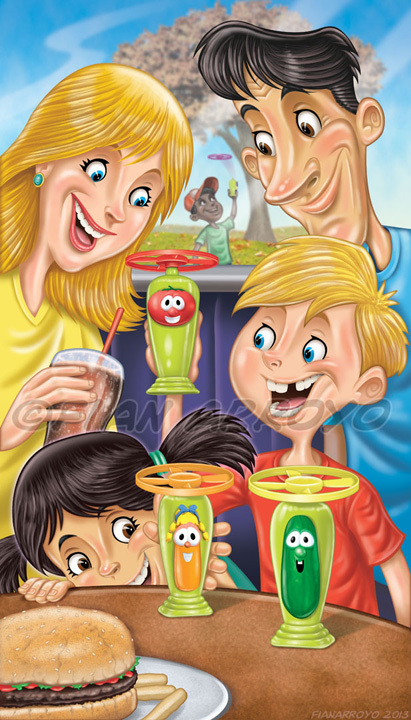 The client wanted to show a mixed ethnic family in a restaurant setting, so I thought a caucasion mom and son and hispanic father and daughter would be the best combo. I really thought that showing the boy with a missing tooth was funny and appropriate for that age...what kid that age isn't missing one or more teeth? :-) The Veggie Tales toy was the main focus so I made sure that one of them was in the center of the illustration to catch the viewers attention immediately.